first , apologies for not posting in over a week. my beloved computer croaked last week, leaving me without a way to blog + edit photos. oh, the horror! luckily, my wonderful new computer has arrived + thus, blogging can re-commence! now, on to more important things, like this soup. is there any meal as deliciously comforting as a bowl of tomato soup + a homemade grilled cheese sandwich? nope? i didn’t think so. believe it or not, my husband recently revealed that he had never eaten a homemade grilled cheese before – how crazy is that? so, on a chilly night a few weeks ago, i decided to show him how truly fantastic the classic pairing of grilled cheese + tomato soup can be. that meal, and this soup? absolutely, positively delicious. this soup is wonderfully creamy, rich, + decadent. between the butter, bacon, veggies, thyme + half-and-half, it really packs an amazing flavor punch. the smokiness of the bacon adds a great depth to the soup, so if you’re vegetarian, use liquid smoke instead of bacon so you can still get that great note. the soup is amazing served simply with a fresh hunk of baguette, + even better when paired with a delicious grilled cheese sandwich hot off the griddle. as a testament to how delicious this soup is, i had a completely different meal planned for last night’s dinner. but, after writing this post + remembering how delicious it was, i changed gears + decided to make this soup, paired (yet again!) with homemade grilled cheese. + it was as scrumptious last night, if not more so, than i remembered it being. don’t you love it when that happens?! heat the butter in a large soup pot over medium-high heat. add the bacon + cook, stirring, until crisp + most of the fat has rendered, about 1 minute. using a slotted spoon, transfer the bacon to a paper towel-lined plate + set aside. lower the heat to medium, add the onion, carrots, celery, + garlic + cook, covered, stirring occasionally, until soft + fragrant, about 8 minutes. stir in the flour + cook, stirring, for 3 minutes. pour in the broth + crush the tomatoes through your fingers into the pan. bring to a boil while whisking constantly. add in the thyme springs (make sure you count them so you know how many stems to pull out later) bay leaves, tomato paste, reserved cooked bacon pieces, + crushed red pepper, if using. lower the heat + simmer for 20 minutes. remove from the heat + let cool. remove + discard the thyme stems + bay leaves. if you have an immersion blender, you can puree the soup directly in the pot. otherwise, working in batches, transfer the mixture to a blender/food processor + puree until smooth. return the puree to the pot + reheat over medium heat. whisk in the heavy cream or half-in-half, + salt + pepper to taste. divide among warm soup bowls + serve immediately. I can see why you’d make it twice! It looks fantastic! 😀 Mmm! This looks amazing! Sounds like a wonderful recipe. I love tomato soup. Thanks for sharing the recipe. Hee, I can’t believe your hubby had never had homemade grilled cheese before! It’s a staple around here for us–and with this soup?!?! Yumm-o! Total bummer on the computer, but I’m so glad you’re back up and running now! Glad you are back up and running with a new computer! This might be my favorite combination in the entire world and I’m shocked that your husband’s never eaten an entire grilled cheese!!! That is insane!! Yum, this looks awesome! Do you think I could use an immersion blender instead? yes, you could definitely use an immersion blender – in fact, it would be easier than blending it in batches. i’ll update the recipe to suggest that, too – thanks kristen! glad you’re back to blogging!! I need some tomato soup in my life again soon and this looks just delicious! Oh no! I’m so sorry to hear your computer died. That stinks. I hope you were able to salvage all of your photos & documents though. I love tomato soup, and love it more when it’s homemade. I even saw an idea on Pinterest to cut a grilled cheese into bite sized pieces & dip in tomato soup like fondue. Brilliant! Your recipe looks & sounds delicious. some of my pictures/documents are still on the dead computer, but the folks at the apple store think they’ll be able to pull everything off no problem. phew! + luckily i backed up my computer pretty frequently. ps – love the idea of doing a mini grilled cheese ‘fondue’ with the tomato soup. such a fab idea! I missed you for a week! But with the new mac and the grocery store mishap, I totally understand. How was it before adding the heavy cream? My husband prefers his tomato soup not creamy. I was wondering for making it and then dividing it up to make creamy for me and regular for him. Hi Amy! This recipe looks delicious. I can’t believe your hubby never had a homemade grilled cheese. Good thing he has a good wife to make it for him WITH this delicious soup. I actually never had tomato soup until I was much older. I didn’t have a lot of American type foods until I was out of my parents’ house I guess. I will definitely have to try this one. I think I might like the creamier version over the regular one! Have a great week, buddy! ha, isn’t he so lucky to have me around? =) you’ll have to let me know what you think of this soup if you try it – it’s definitely one of my favorites. have a lovely week, friend! This is totally screaming comfort and “eat me”. Delicious and beautiful! Oh this looks PERFECT. Not a traditional recipe by any means. I mean, bacon? In a soup? I’m in LOVE. i couldn’t agree more. bacon in *anything* is pretty much a win for me! yay for new computers! and for tomato soup that will make it all better. this sounds amazing! i agree, cassie – yay to both! This soup sounds amazing! I love tomato soup alone or with grilled cheese sandwiches. I’m officially challenging you to make this vegan next time and see what you think. Olive oil instead of butter, no half and half (just skip it), vegetable stock, and Liquid Smoke. It’ll definitely be cheaper and healthier and I bet it will be just as tasty! challenge officially accepted! honestly, i’m 99% sure i’ll like it just as much, even if the flavors are slightly different. the real test will be to serve it to others without telling them that i altered the recipe, + see if they can even tell a difference. =) will report back! 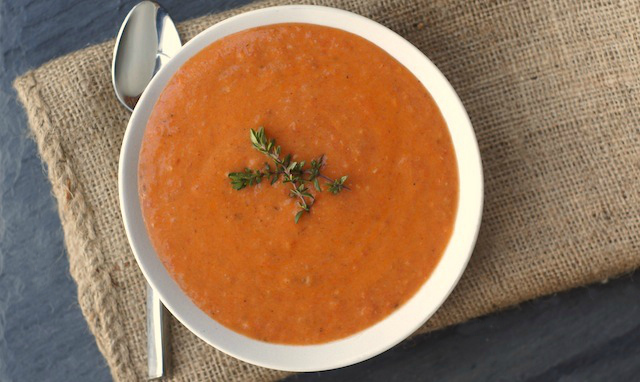 I’m obsessed with creamy tomato soups such as this. This looks absolutely delicious and something I’d gulp up instantly! I’m glad you got your computer back yay for a new Mac! Instant droolage! I was not even expecting the bacon! Honestly a mind-blowing recipe that is causing me hunger pangs! And HOW CAN YOU NOT HAVE HOMEMADE GRILLED CHEESE? For shame sir…for shame. Good thing you made him some! Jeff, you’ve definitely gotta try it – the bacon adds sooo much depth + a lovely texture to the soup. + my husband agrees – he’s so happy he now knows the gloriousness that is homemade grilled cheese! Welcome back to the cyber world with a new and hopefully improved computer. Nothing wrong with getting back into the swing of things with an enjoyable bowl of tomato soup. Delish! it’s definitely improved! my old computer was a dinosaur, always freezing + crashing. this new one is a zillion times better! I apologize too dear Amy! I’m in Italy in this period: I can neither cook nor post anything… I miss all that! Homemade grilled cheese and tomato soup?! I’m in! i was wondering why i hand’t seen you post anything in a few weeks! glad to know it’s for a good reason – because you’re in italy! hope we get to hear all about it once you get home. =) enjoy the rest of your trip! Oh, YUM! Tomato soup has always been one of my favorites!!! And with bacon? You’ve got me very intrigued!!!! There aren’t many things that are better in the world than a bowl of creamy tomato soup. Love it. Amy, how could someone not have had a grilled cheese before? And this iconic duo is wonderful. This is the kind of food to get back to. 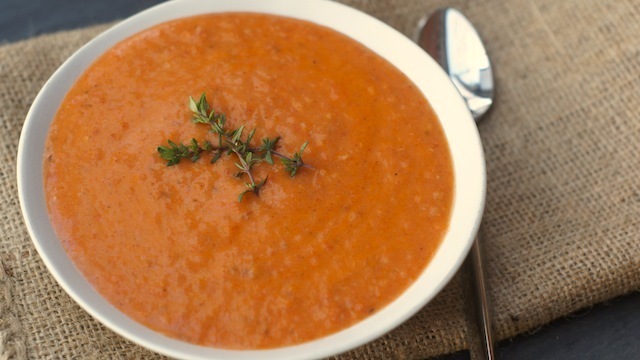 Nothing like a warm bowl of creamy tomato soup! We make them a lot. This looks outstanding!! Grilled cheese and tomato soup is my all time favorite after a long day So simple and comforting! This one sounds amazing! I love creamy tomato soup but I have never had it homemade. Looks like a winner!